Kion: Make sure to eat good. 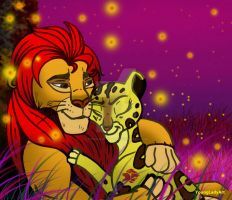 Kion: And take time to rest, we need you with energy. Please comment if you like! That's OK, we all have our own tastes. 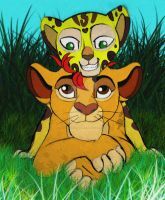 I actually do support Kion and Tiffu as a couple since she seems cool and she is friends with Kiara. 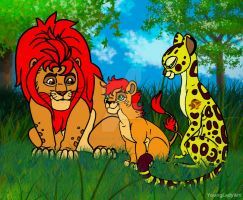 Funny thing, it reminds me an idea I had a long time ago with Kion transformed to a (female) Lioness, I think from Kiara because he does not get girls, most likely magic from Rafiki. From there he understands it more and the jobs of Lioness and seems pretty cool. From there it could end in two ways like he becames a Lion (male) again or stays a Lioness. If this interests you, you are welcome to make your own version of this. Just give me credit on the original idea. 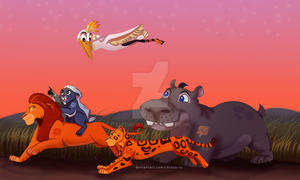 Personally I like the idea of him ended up staying a Lioness (with the Roar of course) and maybe still ending up with Tiffu or a male Lion or male version of Tiffu, your choice. Ohhhh ok! 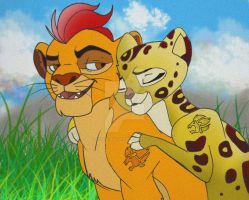 I also ship him with Tiifu, its my second fave ship with Kion! But I am really looking forward to seeing the snow leopard Chuluun in the next season! omgggg I want to see it too!